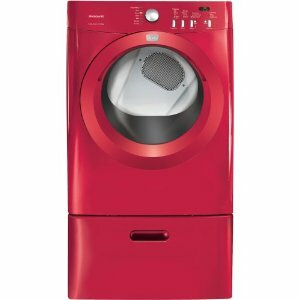 The classic red Affinity Series Gas Dryer is the latest model from Frigidaire. The dryer offers several helpful features that will make the drying chore much easier. Users have five temperature selections and four dryness levels to choose from, along with a special electronic moisture sensor. This dryer model offers a variety of temperature and drying options. Its seven cycles include a heavy cycle for large loads and a quick cycle for quick 25-minute dry runs. There are also four dryness levels to choose from, as well as five temperature selections. Temperature options include high, maximum, and low. There is also a No Heat or Air Fluff option for clothes that donít require high temperatures. The model brings more to table with its six auto dry cycles and six timed dry cycles. Cycle options range from heavy, normal, delicate, to casual ó all covering the common types of fabrics used in a household. Thereís also a towels/bedding setting among the drying cycles. The Affinity Series gas dryer incorporates distinct features such as the DrySense Technology, TimeWise Technology, and Express-Select Controls. DrySense Technology reduces the appearance of wrinkles while TimeWise Technology patterns the clothesí wash time with the drying time. This time period lessens how long you wait as your clothes dry. This Affinity series gas dryer is available in classic red, classic white, or classic black. All colors are painted stylishly on the dryerís steel drum base. The gas dryer is can be protected using a control lock ó a feature particularly useful for households with small children. Drying cycles and temperature settings are easily selected thanks to the dryerís express-select controls. Users can quickly select each option by pushing a few buttons. Basic drying and temperature options cover all kinds of fabrics. Twelve type of specific settings are available, which include extended tumble, shrink guard, and three status indicators. TimeWise technology lets you enjoy your clothes without any creases. The Quick Cycle option allows users to dry-and-go with its fast 25-minute long run. Cycle options are not as much as other available models. Drum light in the interior is only optional. Model doesnít have an energy star rating. DrySense Technology reduces crease on clothes. Easy to navigate and select menu. Ultra-Capacity design lets users finish laundry faster. Settings from previous run can be saved to be used again. Drying can be done in less than 30 minutes with the Quick Cycle option. Ultra Capcity combined with Fits-More technology, providing a larger space for loading clothes. Cycle signal lights guide owners on how to select the different drying and temperature options. No heat or air fluff temperature option included for drying non -washable items. Number of dryness level selections and drying cycles is few compared to other dryer models. Temperature options are limited to four types.s with the Quick Cycle option.